Review: Africa Seven continue their rich vein of releases this year with an indepth exploration of the Tala A.M. discography. Those unfamiliar with the Cameroonian's story will be shaken by the adversity he lived through before going on to enjoy a successful music career; blindness and the death of both parents afflicted him as a child. However Tala Andre Marie's love of music was his guiding light, as was Cameroonian icon Manu Dibango who helped him relocate to Paris and thus began a recording career consisting of no less than 13 albums! 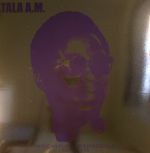 African Funk Experimentals 1975 To 1978 sees Africa Seven dip into the Tala AM archives for a ten track presentation of his funkiest cuts during the early years of recording for the Fiesta label. "Hot Koki" is a particular treat, whilst disco selectors will love "Sugar Lump".